From the builders of some of America’s earliest railroads and farms to Civil Rights pioneers and digital technology entrepreneurs, Indian Americans have long been an inextricable part of American life. The Smithsonian traveling exhibition Beyond Bollywood: Indian Americans Shape the Nation details the history of Indian Americans and their contributions to the United States from the 1700s to the present. The first-of-its-kind exhibition from the Smithsonian will be on view at the Ontario Museum of History & Art, Thursday, August 16, 2018 through Sunday, September 23, 2018. Created by the Smithsonian Asian Pacific American Center and the Smithsonian Institution Traveling Exhibition Service (SITES), “Beyond Bollywood” features Indian Americans’ migration experiences, working lives, political struggles and cultural and religious contributions. Approximately 17 million people in the United States are of Asian and Pacific Islander descent, and the number is expected to climb to 41 million by 2050. One in every 100 Americans has a family connection to India. Indian immigrants helped build the nation’s railroads, worked in lumber mills, toiled on farms and established prosperous trading routes that are still in use today. Through a vibrant collection of photographs, artifacts, art and interactive learning stations, visitors will experience the Indian American story and explore the many dynamic roles Indian Americans have played in shaping America. “Beyond Bollywood” is accompanied by education curriculum and an opportunity for individuals to share their family stories through a digital portal. Beyond Bollywood: Storytelling and Art! Learn about India’s rich culture through tours of the Beyond Bollywood: Indian Americans Shape the Nation exhibit (2 PM), art workshops (1 PM to 4 PM), and storytelling with Karen Rae Kraut (3 PM). 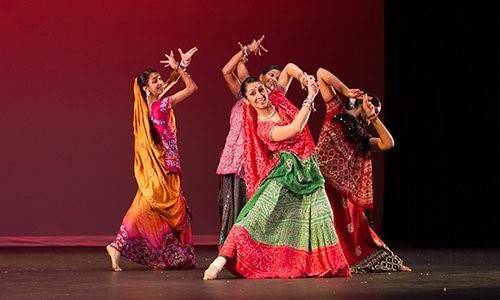 Explore Bollywood and Bhangra dance from India with a class lead by Rajat Rocky Batta Dancy Company. All levels of dance experience are welcome! Space is limited. The exhibition has been funded in large part by donations from philanthropists and corporations from across the country. Lead gifts came from Dr. and Mrs. Kanu Shah and Sadhana and Rick Downs, with additional major gift support from TV Asia, the Epker-Sinha Foundation, Citigroup Foundation, Umang and Ruth Gupta, Gautam and Varsha Chandra, Washington Gas, Asian American Hotel Owners Association, Goldman Sachs, Robert N. Johnson, Sunita and Dan Leeds, Haresh and Alpa Bhungalia, Amita and Purnendu Chatterjee, Girish and Indu Jindia, Rohit and Joy Kirpalani, Anil and Sonjui Lal Kumar, Dr. Mahinder and Sharad Tak, Southwest Airlines and the Network of Indian Professionals Foundation. SITES has been sharing the wealth of Smithsonian collections and research programs with millions of people outside Washington, D.C., for more than 65 years. SITES connects Americans to their shared cultural heritage through a wide range of exhibitions about art, science and history, which are shown wherever people live, work and play. Exhibition descriptions and tour schedules are available at www.sites.si.edu. The Asian Pacific American Center provides vision, leadership, and support for Asian and Pacific Islander American initiatives for the Smithsonian Institution and works to better reflect their contributions to the American experience, world culture, and the understanding of our planet and the natural world throughout Smithsonian Institution collections, research, exhibitions, outreach, and education programs. The City of Ontario is Leading the Way in creating urban lifestyle districts that create sustainable places to live, work and play. Located just 35 miles east of downtown Los Angeles, the City of Ontario is ideally situated as Southern California’s gateway. With three major interstates, two railroads and the Ontario International Airport, Ontario offers direct access from Los Angeles to the rest of California, and to North America. With over 170,000 residents and residential development on the rise, Ontario looks to double its population in the next 20 years, making it one of the 100 most populated cities in the nation. Complementing its business and residential core, Ontario dazzles with its amenities such as the Ontario Convention Center, Citizens Business Bank Arena, and the Ontario Mills Mall. To learn more about the City of Ontario, visit www.ontarioca.gov or call (909) 395-2000.